Color was more than enough to satisfy any woman. 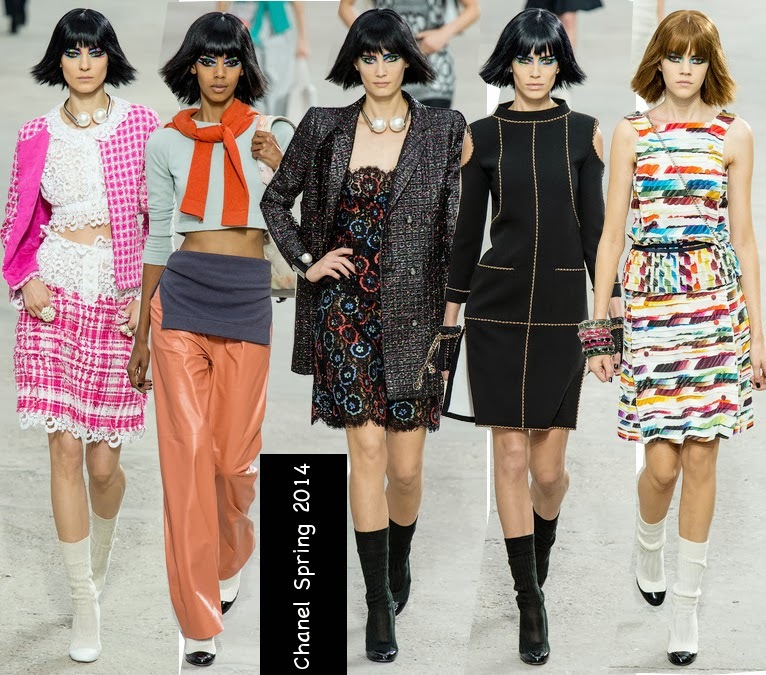 He began with a series of iconic Chanel tweeds or vibrant lightweight bouclé in pink, navy, gray, and white. There were gorgeous knits, sleeveless and short dresses with insets of lace and cropped tops, relaxed leather-thin pants and t-shirts, and much more. He basically offered women all the trends that we’ve been seen from other designers in one whole show; punk, classic, or chic – you decide how you want to look. The highlights of this presentation though were his finale of multicolor print dresses composed of pleated strips sewn together. You had to see these pieces up close to understand why Mr. Lagerfeld is such a genius. They weren’t just a rainbow of color strips splattered on them or taken into a heating device for pleats to come out perfect…………….they were done with superb intelligence (creativity) and sophistication as the Chanel lady implies. Accessories – graffiti backpacks, creative canvas handbags, oversized pearls that resembled some cool headphones and bracelets, metallic chain phone cases, trompe de l’oeil shoes, and reappearances of Lego purses – took the entire collection to a wonderful irony of masterpiece without letting go the Chanel essence. Only Karl can make an 89 piece collection look so non-boring and youthful than ever with a vast amount of unique variety, color, and texture. We’d just wish we were part of the Karl/Chanel world; as a guy, I’d love to be the artist model, Marlon Texeira, ported down the art gallery. 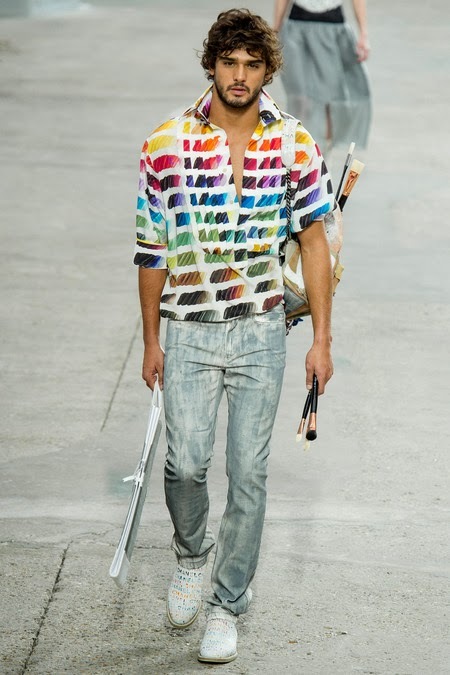 A male model wearing a multi-color printed shirt and washed pants at the Chanel Spring 2014 show. At Valentino, Maria Grazia Chiuri and Pierpaolo Piccioli, were inspired by the world of theatre and opera that led to creating a modern day luxury collection. More descriptive would be the renaissance couture and romantic luxury that runs through the DNA of the house. Honestly, if you ever seen their previous collections, you’d find out they do just about the same types of dresses, but etched with different ideas. It gets boring besides their hot mini-dresses that are a hit every season, which next spring will come beautifully embroidered with prints and flirty peekaboo details; all the front row women looked stunning in the duo’s fall collection. 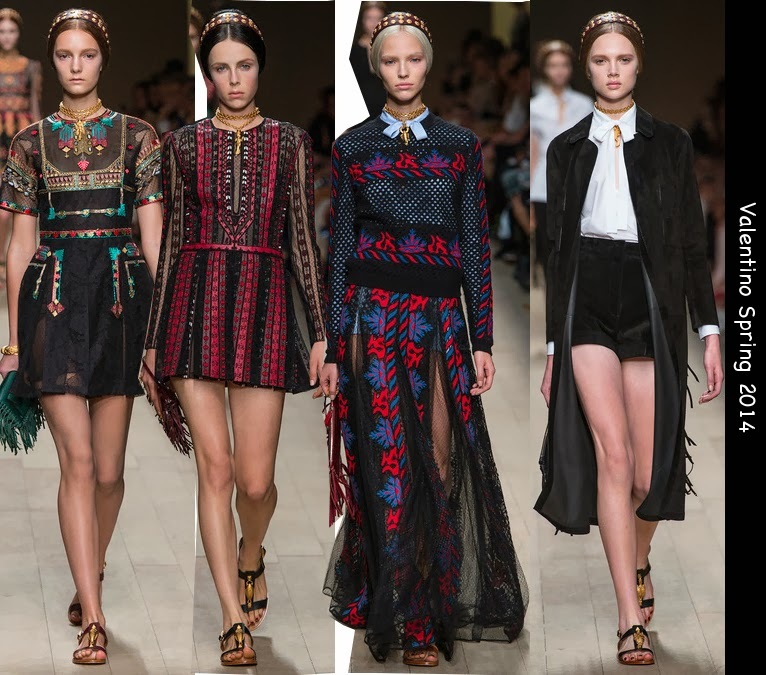 I was intrigued this season though with their long-sleeved dresses – although always bell shaped – that looked more youthful and extremely luxurious with great amounts of Valentino’s signature renaissance prints and lace and tulle. They looked even more enticing for young conservative ladies when worn with sandals; it’ll work for the South. Pleasing were their knitwear or crochet sweatshirts, embroidered jackets, bow-tie shirts spliced semi-halfway and tailored shorts. It showed the designers are bringing more variety to the brand, or maybe it was just a pretty collection of prints that helped out. Alexander McQueen still keeps the beautiful couturier details stamped on its clothes with Sara Burton at the house. I find it hard to describe this collection, because you really have to dive deeply into these pieces to praise their glorious craftsmanship. 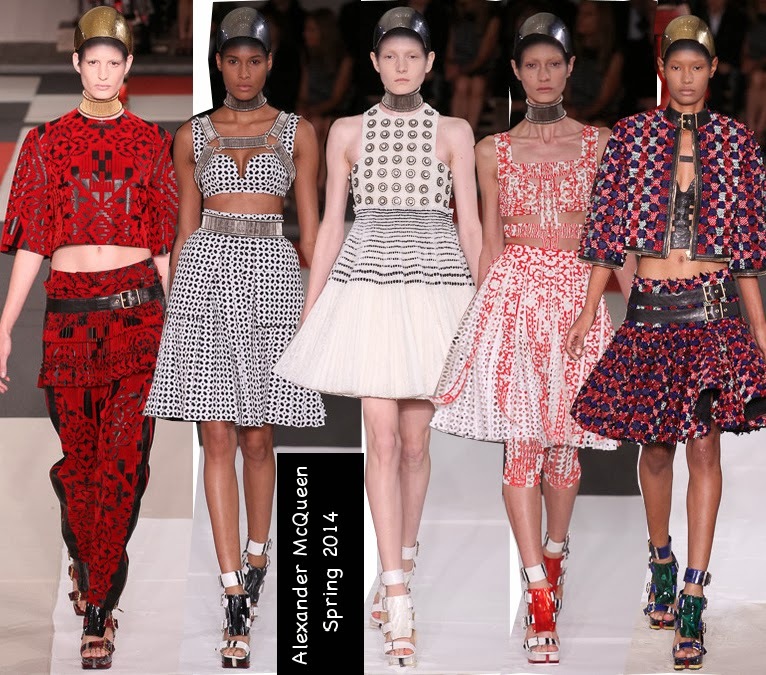 Behind those accessories – helmets, gold and silver harnesses, and chokers – there were surprisingly a great amount of wearable clothes the average customer could wear this time: intricate printed, embroidered, and crocodile bra tops; perforated printed coats; fascinating laser-cut tops and kilts over pants (like a burgundy one pictured above); a white laser-cut dress that was invigorating to watch with diminutive red splashes of couture; and sumptuous flared skirts. While her finale of feather and fringed numbers may not have been ones to wear in real life for most of us, they did make a triumphant statement of the real work the McQueen label is so famous for. There is an intense amount of luxury and hours of work that goes into making one single piece of art come to life so magically. 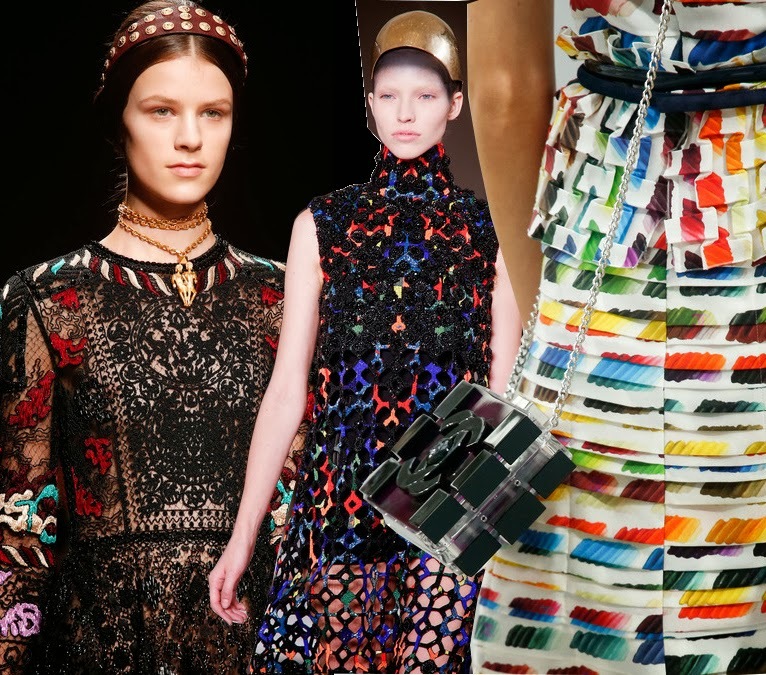 From Left: Valentino, a black lace and embroidered mini-dress; Alexander McQueen, a colorful embroidered and laser-cut sleeveless dress; Chanel, a multi-color dress created with layers of pleats and strips sewn in.